A Capri On The Road | Be a Traveler. Wander Limitless. Be Mad. Explore and Inspire! ‘Chechi, chaaay veno?’ (Sister, would you like some tea? ), asked the make-up man enthusiastically, as he offered me half a tumbler of tea. I sat inside the ten-feet wide make-up room; basically just a thatched shed, and watched him paint the face of a performer who had slid off into a slumber and snored gently. Another man sitting outside, plaited lovely garlands and jewellery from delicate palm fronds. All of this seemed familiar, since it was only a month ago that I had visited Thalassery for my first Theyyam where I had seen the fiesta of 39 Kuttichatans. And here I was, back in Kerala for more, but this time, in a rustic village called Kanhileri, to experience the most resplendent of all Theyyams, namely, the ‘Muchilott Bhagavathi’. It had taken me two weeks of unsuccessful attempts to get through to someone locally who could help, until, finally, I chanced upon my host, Mr. Krishnakumar, who was kind enough to make room for a perfect stranger in his home. I got dropped off by an auto in the wee hours of a humid April morning. I woke up to a generous platter of puttu*, appams*, kadala-curry* and bananas, served by his affectionate mother for breakfast. A bath in the cool water pulled up from the well attached to the bathroom was instantly refreshing. I was immensely moved by the family’s hospitality; I later understood that I was the first tourist to have ever visited Kanhileri! Kanhileri was quiet and peaceful, with a handful of houses amid tall arcadia and rubber trees and a mountain in the backdrop. The Kaav* was a stone-throw away from Krishnakumar’s home. I could hear the beat of the Chenddas* and the clangs of the Illathalams* from a distance. The Kaav was a small block, yet impressive with a tapering terracotta roof (typical of a temple in rural Kerala). A row of ethnic brass lamps hung from its rim that was decorated with strings of vibrant yellow and orange marigold flowers. Food was being cooked adjacent to the temple in huge aluminium vessels, to be served as Prasadam* at lunch. In contrast to most temples in India that strictly serve only pure vegetarian food to its devotees, this one had a non-vegetarian dish in the making. I sat under the huge blue tarpaulin canopy, sweating profusely as I juggled between gobbling on piping hot Sambar* and rice and chit-chatting with curious women eager to know everything about me. Within no time, I felt like being part of one large family. There is no place else where one could connect more easily than our own countryside, despite the worst of communication barriers! In my narration below, I have addressed the performers as “she” wherever the character played is female, to bring out the true essence of the Theyyam. By evening, Theyyam commenced with the Puliyoor Kannan, who came dressed in a wild cat-like attire. His face was painted red while his eye-sockets had a thick outline of jet black. His chest and stomach were bare and painted yellow and he wore a large crown. As he danced with interrogative expressions, children gathered around him, nudging, teasing and screaming their heart out in his ears. Each time this happened, he tried to animatedly scare them away. However, as the cadence gained speed, the Puliyoor Kannan moved into trance, and was now encouraging the kids to scream louder and louder. To a normal person, this would have been enough to tear the eardrums apart! But the Kannan seemed to be unaffected by the hullabaloo and continued dancing till the beats continued.. This was followed by Karanavar (Male), who resembled a king with a dense fake beard extended from one ear to ear. He was soon accompanied by another Karnavar. A series of Vellattams* continued through the night, however, since most of the names sounded similar to what I had seen in Thalassery, I decided to skip them. An overcast morning with intermittent showers provided momentary relief from the unbearable humidity. A bonfire with logs was lit up in front of the Kaav. The Narayil Bhagavati paraded in poise, holding an iron machete and a brass shield. She wore a metal upper-body resembling a bare-chested woman with a huge yellow snake painted around each bosom. The skirt made of stripped palm fronds had Mashaals* affixed to the front which were lit up as the Bhagavathi swirled and danced in a frenzy around the bonfire. After a while, she was taken to the rear of the Kaav where she slit the neck of a live hen (the act of Bali) and drank its blood. I watched from a distance as I just couldn’t gather enough guts to see the act up-close. This bird was later used in the meal as ‘prasadam’ for the day. As the bonfire reduced to charcoal, a pair of Kannangott Bhagavathis arrived. I noticed that size and innateness of the head gear kept increasing with each Theyyam. The performers stooped low and spun with acceleration so as to blow ash from the bonfire Basically, the headgear acted as a fan, sending out clouds of ash in the air, rendering the Theyyam quite dramatic to watch! Vishnumoorthy has his skirt tied to his chest. By late noon, devotees were getting anxious to witness the last but the most spectacular Theyyam. I was asked to hurry to the backside of the Kaav where the goddess, hidden behind a white curtain held by a few priests, swayed gently to the slow-paced thump of the Chendda and the metallic timbre of the Illathalam. When the curtain finally dropped, I saw the first glimpse of the divine Muchilott Bhagavathi, soaked in crimson from head to toe. Opaque metallic eyes and a set of demon-like teeth shimmered through a fragile veil of delicate Ixora flowers that were strung carefully from her massive crown. Her box-shaped rectangular skirt and jewellery were equally humungous and elaborate. An exceptional personification of God infused with visual grandeur and powerful auras blew me off my feet! My eyes couldn’t look away from her charisma as I stood in front of her, weightless and speechless.. The stunning glimpse of the Muchilott Bhagavati with shimmering eyes and teeth behind the veil of Ixora flowers. The Bhagavati took Pradakhsinaas* of the Kaav and sought blessings of the deity. With two fire torches in hand, she danced eternally under the blue tarpaulin to the drumming of the Chenddas and the pitter-patter of the heavy rain. She was then escorted to the temple well where she saw her reflection in the water for a quick second. The eye shield that was scalding due to the heat from the fire torch, was carefully detached. I could see steam coming off when cold water was dabbed on her eyes with a piece of cloth. The Bhagavati had danced relentlessly for hours, carrying along her costume that weighed no less than thirty kgs. The Theyyam concluded with devotees thronging to seek blessings of the incarnate ‘Muchilott Bhagavathi’. The stunning grandeur of the goddess is nothing less than a phenomenon! *Puttu (steamed rice cake) appams( steamed rice pancake, an equivalent of dosa) and kadala-curry (gravy made of black chickpeas usually served with puttu and appams). This is the most common breakfast in Kerala. *Sambar- A tangy, thick soup like gravy made with Daal and vegetables, prepared in South India. 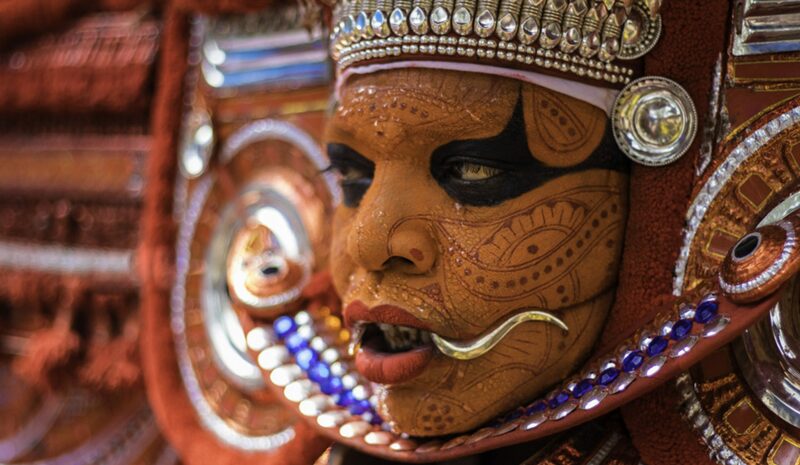 Theyyam, one of the most ancient and traditional form of worship, is unique to the Malabar region of Kerala. As it seeps into coastal Karnataka, it manifests itself as ‘Bhootakola’. Theyyam, I am told, is considered to be a form of Upasna or the attainment of God itself! There are close to 300 forms of Theyyams, that happen across North Kerala between December and April. Every Theyyam is unique in its own way since each has a story behind it. Having said that, Muchilott Bhagavati is the grandest in my opinion. I have complied the below list of temples where you could see the Muchilott Bhagavathi. The dates given here might shift a bit, year on year. All of these are typical villages and some might not have ever seen a tourist before, like in my case. You are suggested to google up info and make your own plan. I prefer it that way than to team up with a tour agency who gives everything to you on a platter. For Kanhileri, you may reach out to Mr. Krishnakumar. Write in to me for further info and I will be glad to assist you! My life right now : At 36, when most women of my age are busy planning kids and buying homes, I am happily planning my next travel destination! The social stigma around how ones life needs to be bracketed into doing the same stuff that everyone else around you is doing has only pushed me farther away to seek a life that lies beyond the stereotypical. Where it all began : My tryst with travel started when I was in college. I was an occasional trekker then. Soon after I started working in 2004, I booked myself for a safari at Kanha National Park in Madhya Pradesh. The agony of going for the trip with a Nokia N73 phone is unforgettable. Kanha had kindled an instant liking and interest towards wildlife and birds. When I returned, I bought myself a Bikram Grewal bird book, a binocular and a Nikon point-and-shoot camera from the little savings that I had. I developed a keen interest for birds and just like most hobby-photographers, I could not pull myself back from the addiction. I migrated to an entry-level DSLR with a basic telephoto lens and self-learned photography. When I realised that my equipment had limitations and so did my patience, I decided to deviate from wildlife photography, thus suppressing my desire of owning a good tele-photo lens. For better. My love for photography : As my travels continued, I started exploring other genres of photography that did not necessarily need expensive gear and that is where my passion for travel photography took off. I began to develop a fascination for culture, color, people streets and landscape. Few good things about travel photography are the spontaneity, the vibrance, the element of surprise and YOUR perspective of looking at things. Though I consider myself as anti-social, the more I traveled, I realised that interacting with unknown people came easily to me. After a few years of dragging on with my basic DSLR, I began renting cameras and lenses for my trips until after my Mathura trip, when I purchased my canon 7d mark ii. Photography has become an inseparable part of me since! My tryst with writing : My trip to the breath-taking gorge at Gandikota, Andhra Pradesh in 2015 was so remarkable, that I felt like penning down all that I had experienced. My first blog happened! Little did I know then, that a baby step I had taken, would instigate me to to take up travel blogging. With constant appreciation from friends and family, I started penning down each of my escapades religiously! Within a span of 3 years, I ended up having a decent collection of write-ups. Now, my travels revolve around my thirst for stories, though most of the times, stories just happen and I do not really have to go searching for one! My dilemma and how I overcame it : Most of the travelers I follow, have left home and live location-independent. I was fascinated by their stories, their world and their courage to take a plunge into the unknown. So much so, that I had bouts of urgency to follow their path. Each time I tried to decide in my head, something kept pulling me back. Somewhere in my head, I wasn’t really sure if that is what I was seeking. Is necessary that you travel like a maniac nomad just because you want to prove to yourself that you are a traveler? No, not at all. An urge to return to the comfort of my home after a long travel, does not mean that I am not a traveler in true sense! And thus I chose to be a sporadic traveler..
How and where I travel : Luxurious travel for me is alien, moreso, I do not exist in the world of idiotic selfies! I am a rugged and budget traveler. My preferences are mostly home-stays and hostels. The best was to give back to the society as a traveler is when you promote responsible tourism and thus, I prefer going local. I am a foodie as much as I am a traveler! Though most of my travel is around culture and places, my preference would be to drift away into solitude on a mountain or sit over the edge of an ocean, dreaming and watching a sunset. How travel changed me: Being amid mountains and seas, has taught me to look down and beyond my minuscule problems into the infinite world of vastness and happiness. It has given me knowledge that lies beyond the four walls of my office. It has taught me to be patient and flexible. I now know the importance of giving back to society and to nature. Travel has made me overcome my fears of going solo. Above, everything else, it has taught me to offload pride and live humbly. My way forward: A coffee table book with my travel stories and pictures when I turn 50 is brewing in my head. I want to be an inspiration for all those women who want to travel but cannot refrain from their current responsibilities. My message to you : Be a Traveler. Wander limitless. Be Mad. Explore and Inspire! The forest inspection bungalow sat in quietude amid jackfruit, mango and mahogany trees. Insects hovered around in plenty; encircling under the tube-light and crawling on the walls and the white marble floor. I stepped out on the porch and sauntered around with my cup of piping-hot instant coffee. The air was still and sultry, yet pleasant. Thattekad, illuminated by a pale moon looked both lovely and creepy at the same time. Under the flash of our swaying torchlights, we walked to the other side of the road into the sanctuary towards Girish’s homestay. After reading a few blogs that spoke highly about his birding expertise I had cherry-picked Girish from the handful of guides at Thattekkad. Girish’s family comprised of his wife, two kids, his mother Sudha and his 90 year old grand-mom. A lawyer by profession, he was a cheerful man in his forties. Thattekad being his birthplace, he had developed a keen interest in birding since childhood. Sudha, a soft spoken and energetic lady, was a bird enthusiast too! Interesting conversations unfolded around Thattekad and its ecosystem. Girish’s home, painted in electric blue, nestled cozily in the forest canopy. An army of Malabar frogs dwelling in his courtyard had taken me by complete surprise! With their smooth and vivid green body, yellow feet and bulgy yellow eyes, they looked like characters out of a fairy tale. Gliding frogs are tree frogs that can make gliding jumps of upto 12 meters, approximately 100 times their length. This rare specie is found only in the Western Ghats. Seven kilometres away from the main sanctuary, Urulathanni was waking up to a cloudy and drizzly morning. Such a weather in the mid of May was both unexpected and disappointing. To our luck, it cleared off sooner than anticipated. Traversing through teak and rubber plantations, we reached a flat rocky patch, ahead of which, a moderately elevated climb led us to a clearing that presented a panoramic view of the forest and the mountains surrounding Thattekad. A small tribal hut stood towards one end. Girish mentioned that the hut was in the elephant and leopard crossing zone, but the small tribal family of four along with their dog, were well adapted to the lurking dangers. We glanced around and realised that this stretch was bustling with flower-peckers, minivets, starlings, hill mynas, parakeets, sunbirds, drongos, hornbills and others flew in plenty. The sun was up and the birds we active already. Girish sped like a superfast train, spotting and identifying birds by their flight and calls, while I struggled to keep up with his pace. The hyper-activeness of the birds and the considerable distance from them made focusing almost impossible. I toggled frustratingly between mounting my beast-like lens on the tripod and hand-holding it. As the morning sun became harsher, humidity started taking a toll. I hadn’t clicked a single good image, except that of a giant butterfly and a bug! Eventually, when the heat became unbearable, we started to descend into the lower terrain. It had been a frustrating and ugly start! ‘I can’t see them’ I uttered in an anxious, but hushed voice. ‘Go closer, be careful not to touch or shake the branch though’, instructed Girish. I inched further towards the bunch of dried leaves of a slim tree that stood amid hundred other identical trees. I noticed a withered leaf gently ruffle for a split-second. I found the pair of Srilaka Frogmouths roosting on a fragile branch; one of which had acted like a dead leaf dangling in the wind! They duo was glued to each other, absolutely motionless and so perfectly camouflaged, that if not for Girish, I would have never been able to locate them, even at such close proximity. Srilanka Frogmouth is one of the tougher birds to spot due to its plumage that resembles dried leaves. More so, these are nocturnal and usually perch at the same spot for long hours with slight or no movement. Its elongated eyes, wide bill with moustache and frog-like face renders it both beautiful and weird-looking at the same time! We encountered more frogmouths at considerable distances from each other later on the trail. It wasn’t surprising that we bumped into all of them at the exact same spots over the next couple of days. Srilanka Frogmouth pair- the female is rufous and the male is slightly grey in color. Noon was well-spent near a placid lake which had a colony of bee-eaters and swallows As the sun began to set, we were back into the forests to hunt down the Jerdon’s Nightjar. However, our attention was diverted to a loud and mystical ‘wooooh-woooh-wooooh’ that echoed from a distance. “I think its a Spot-bellied Eagle Owl, but I am not sure!”, Girish exclaimed overwhelmingly. We hastened through the bushes and thorny shrubs, in the direction of the hooting. Each time we felt like we were getting closer, the owl would pause for a few minutes and then hoot again, but farther away. This hide and seek continued for sometime, until we eventually gave up! It was high time we headed back for the nightjar. Girish brought us back to a small expanse, not too far away from the road. He started playing the nightjar’s call on his phone repeatedly. Drawing our attention towards two bare branches of a bush nearby, he confidently implied, “It would fly around here anytime now and sit on either of these branches for a few seconds; be ready”. And as though Girish had some premonition, a beautiful Jerdon’s Nightjar perched exactly on the branch that Girish had pointed out. Its plumage was in shades of black, brown and white and it had deep black eyes. It sat for less than thirty seconds before disappearing into the woods. This was too good to be real! A faint and short ‘eaw eaw’ lead us offtrack and down a gentle slope to the base of the jungle with a brook running through it. Here, the ground was moist and laden with leeches. Albeit my efforts and repeated pleas from my husband, I just couldn’t pull my attention off the blood suckers and in the bargain, we lost track of the Trogon. I looked down to pull away from the cursing look on his face, only to find that three leeches had already crawled up my left foot, despite all the drama I had put up. We continued walking off-road for a few meters and connected to the-mud trail in no time. My face lit up as we chanced upon a beautiful pair of pruning Trogons just 10 feet away! The male was handsome, with a bright crimson front, black head and white color. The female had a chrome yellow chest while the head and collar were brown. Malabar Trogons are resident birds of the Western Ghats. Due to their shy nature, they are usually found in thick canopies. Even with such striking colors, they blend well with their surroundings since their backs are camouflaged! For me, these were no less than the birds of paradise. On the last day, we explored the Salim Ali trail inside the Thattekad sanctuary with Sudha. Apart from a jungle owlet, a few malabar parakeets we did not sight anything much. A stunt watch tower inside the forest threw some scenic views. Further ahead, we reached a pond skirted with dense growth of bamboo beyond which the trail opened up into a long and narrow path with thicket of tall trees on either sides. Drongos and woodpeckers wandered in abundance. A pair of white-bellied treepies with never-ending tails, looked majestic when they flew from tree to tree. These again, can only be found in Western Ghats. With the last bird on my wish-list ticked off, it was time to leave. An unexpected overcast took over Thattekad, vanquishing the intolerable airlessness with soothing whiffs of cool winds. We drove past the area where had head the enigmatic hoots the previous evening. From deep within the woods, the uncanny ‘wooooooh-woooooh-woooooh’ echoed, piercing the silence of the jungle. The mysterious owl though, had made up its mind to maintain its inconspicuousness. About Thattekad: Thattekad is a dense evergreen forest situated approximately 65 kms to the east of Cochin in Kerala. More commonly referred to as The Salim Ali Bird Sanctuary, it is considered to have the richest bird habitat in the peninsular region of India with close to 280 reported species(resident and migratory). In the local dialect, Thattekad translates into ‘Thatte- plate’ and ‘Kad-forest’. The topography of Thattekad comprises of flat rocks and hence the name. Also, the pristine Periyar river branches into and cuts through the sanctuary. Few rare birds endemic to western ghats can be found here. Urulathanni is the richest in terms of bird species and population, in my personal opinion. Best time to Visit : Oct through March. To skip the crowd of birdwatchers, one may visit in April, though most migrant birds return from Thattekad by then but resident birds can be sighted in plenty. By Air : The nearest airport is Cochin. Private taxis could be booked to reach Thattekad. By bus : Overnight bus from Bangalore to Koothuparamba- local bus to Kothamanagalam- local bus to Thattekad. Where to eat : the nearest eatery joint is 3 kms away. Thattekad is mostly rural, hence no big hotels in the vicinity. Kothamangalam is a slightly bigger town, 12 kms away. Guide info : Girish @ 9847034520.